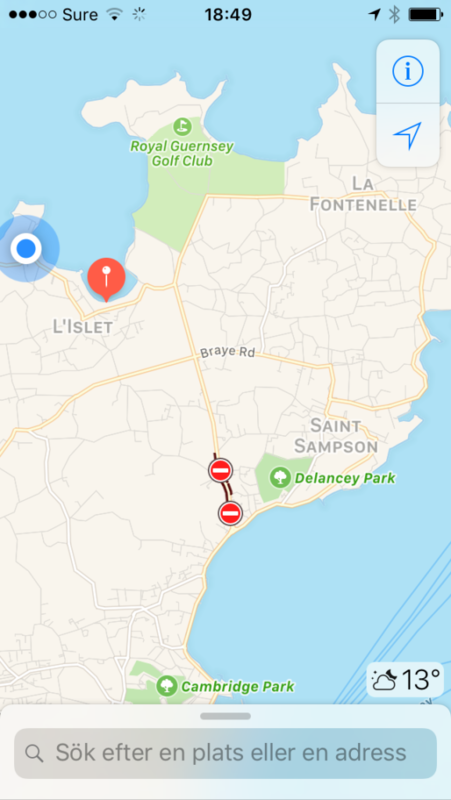 I arrived in Guernsey in late October, to participate in the Guernsey Chess Festival; possibly my favourite tournament in the World. En route, I spent three days in Godalming with my friend Alfredo, Simon Williams, Clive Simmonds and Simon Ansell, shooting a video about the Modern Defence. Alfredo and I stayed at the “King’s Arms”, which is – we were informed – one the more haunted places in Surrey, if not in all of England. I stayed in the loft and slept like a log while Alfredo got room no… (forgotten), which was supposedly the most haunted room of them all. He slept as soundly as I did. No ghosts in sight. Horror was absent. Echoing what I wrote last year at almost exactly the same time: I had a tough year behind me, with few games that I was proud of. The spring was uninspiring and the summer even worse. A few decent games did little to make up for numerous not-so-decent games. I usually focus on playing well, but things had gone too far and “playing well” was for once becoming suspiciously close to an excuse for not playing well enough. I arrived with a full set of support. Among other things: J. sent me inspiring gif:s every morning, A. convinced me I am better than I felt I was (that such a thing should be possible…) and so, I was dead set on winning. Still, winning when you don’t play well is hard and perhaps not a very productive aim. Under normal circumstances I even find “winning” to be a rather silly goal. This was to be an exception, just to get me back in a more focused mind-set. 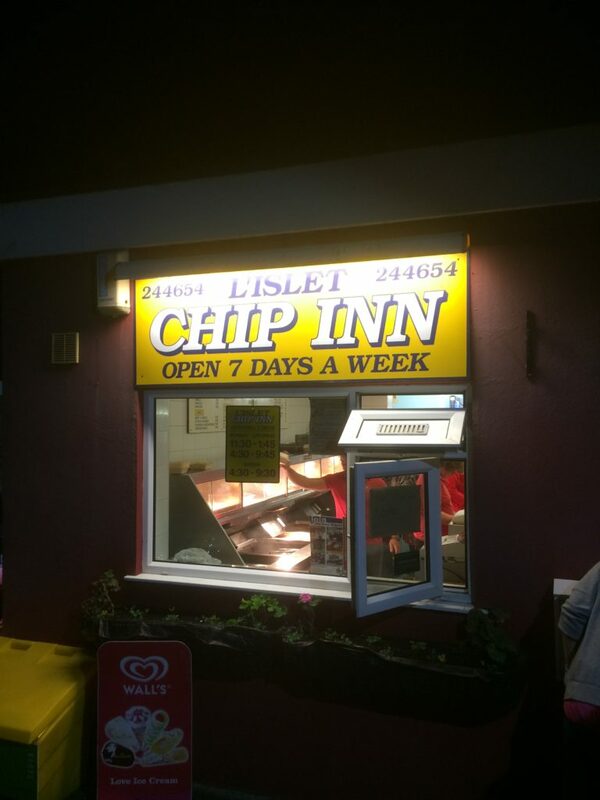 The evening before the first round, I couldn’t find anywhere to eat and rediscovered the “L’Islet Chip Inn”, a fish’n chip, hole-in-the-wall kind of establishment, where I used to go and eat years ago. I had completely forgotten about the place and was convinced that it had closed. With the food in a plastic container I stumbled through the darkness while eating the fish with my fingers. It was delicious and had I found a place to sit down, it would have qulified as “perfect”. I started out with 2/2, but in the third round, against John E. Curtis, I lost all sense of objectivity and found myself in a lost position by move 15. It was a small miracle that I managed to win the game in the end. Later in the evening I went to L’Islet again and took my food to a small stone slate bench by the Cobo Bay. When I picked up the first piece of fish I noticed a movement in the (near complete) darkness to my right. A cat; a white-ish cat. Perhaps it had been drawn by the smell of the fish. I took another bite. I saw the cat come closer in the corner of my eye. I turned my head. There was no cat. Well, stranger things have happened; my eyesight is not what it was and the mind can play tricks on you. A few moments later I was it again, to my right, a few feet away and I turned my head. No cat. Nothing. How ironic. I stay in the most-haunted-hotel for three nights without sensing even the slightest occult occurrence, but when I eat my fish’n chip a few days later I run into a ghost cat. At this moment, my crazy laughter scared the hell out of some boy scouts who were out in the darkness watching for the orionid meteor shower. They scattered in the darkness. I restrained myself. Now, let me make something clear: I do not believe in ghosts. I accept that there are people who do, but I loathe the commercialization around it. Paranormal reality shows are about the worst thing I know. (I have to swallow a number of times in order to find a non-insulting adjective to describe my feeling towards them and in the end I can’t find one. “False” hardly qualifies as non-insulting.) But, as I sat there in the darkness, thinking about it, it made a whole lot of sense that of all the ghosts that I could possibly have seen, I had seen a cat ghost. Due to my name, I’ve always had something of an obsession with felids; real as well as fictional. A cat once fell on my head (from the fourth floor) when I entered a store in Malmö. I don’t usually miss a chance to make a cat part of my personal narrative. Nor would I miss the chance this time. So, I decided to embrace this ghost. Perhaps, even, it would help me win the tournament?! It is the second time I have been outplayed by Jean-Pierre and managed to turn the game around. I fear that not even a ghost cat will be able to help me, if I get into this kind of a pickle a third time. After this game I managed to pull myself together and play some almost decent chess. A draw with Black against Korneev in round 5 was comes to my mind. In the last round I was even able to draw and still become clear first. There are those who fear that the world will become a dull and unimaginative place if we stop believing in things like ghosts and whatsnot, but I cannot agree. The stories that we tell can be as powerful as the truth (whatever that is…), but imagination and truth-seeking are not the same and should not be put on equal terms. I lose people if they go from “I believe” to “I believe and it is my right to express and treat my beliefs as universal truths”. The latter truly horrifies me and the consequences of this kind of attitude is the only true horror story that I know of. 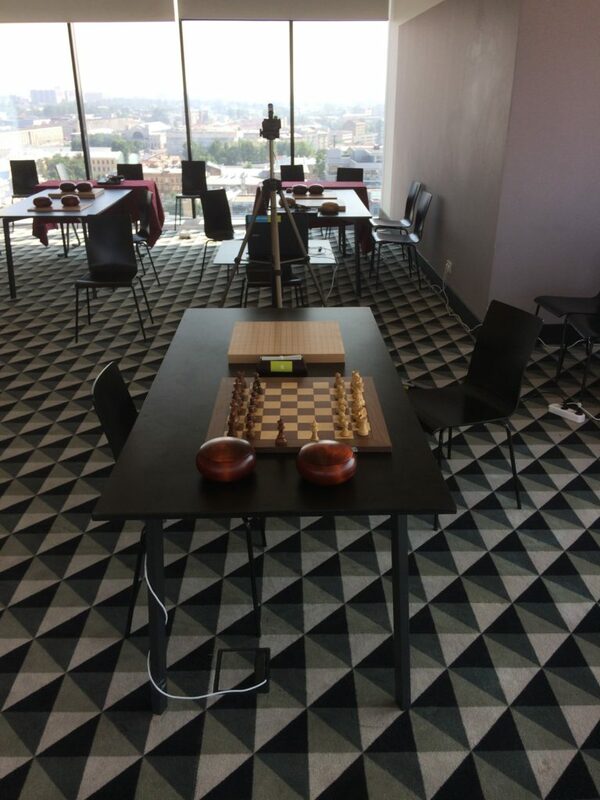 Saint Petersburg match against Alexander Morozevich, part 1. When I first arrived at a chess club in 1984, I was already hooked on chess. I had played with my father for a few years and was in the habit of writing down our games in i red notebook. If someone asked me then whether I wanted to swim, play, go for a walk, run a kite, or just about anything, then what I’d really wanted to say was: “I’d rather play some chess”. I usually didn’t say that, but the feeling was there. One of the things that I have loved about learing to play go is that I sometimes get that same feeling (to the annoyance of those close to me), that, no, I’d rather just play a game of go. 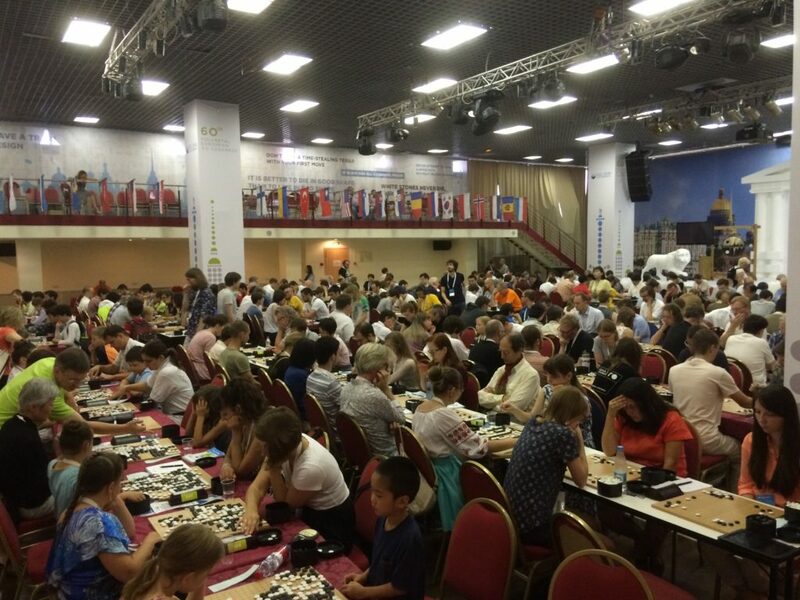 I write this just to give you a sense of how happy I was when I was invited to the European Go Congress, to play a combined chess- and go-match against Alexander Morozevich in Saint Peterburg. The match took place the 27:th of July and although I lost it 3-1 it was a great experience; one of those that can make a guy like me go humming “je ne regrette rien” for days. The best part was that I managed to play another ten go games in the two days I was there and got to meet some very strong go players. My opponent needs no presentation in the chess world, but I knew little about his strength in go. Alexandre Dinerchtein 3p wrote that AM was “close to 3kyu”, but when I heard that he had already played a few tournaments and was to play both weeks at the European Go Congress, I sensed that he would probably improve fast and that anything was possible. I arrived on the 26:th and spent the evening going from hall to hall, checking all the side events and eventually I ended up at an outdoor bar where go players where hanging out, playing and analyzing games. I intended to prepare a bit for the chess games, but in the end my preparation came to primarily consist of a few hours of evening go. After the weekend I’ll cover Cellavision Cup and my match against Morozevich.